I realize this may seem like a repeat of last week’s post, but the problem is I have a fever… and the only cure is GREEN SMOOTHIES and more cowbell, always more cowbell! That said, I think more green smoothie talk is warranted because, let’s be honest, most of us are pretty busy and getting in greens and other superfoods that support us to feel energized and on top of our game can be a challenge! So this week, I’m sharing tips for making green smoothies a quick and easy staple, ideas for saving money on produce, and, as promised, a super awesome table to aide you in creating your own glorious green smoothies! Make green smoothie ingredients regulars on your grocery list. Having the right foods in the house is everything! Have Naked Eating’s “Create Your Own Green Smoothie” table and other favorite green smoothie recipes ready for action. Take a screen shot on your phone and store it in your notes to double as a grocery list. Buy greens that are ready to go or prep them so all you have to do is toss them in the blender. To prep greens, I start by trimming the stems, cutting the bottom off (romaine) and/or de-stemming (kale and collard greens). Next, I rinse the greens under cold water, throw them in the salad spinner (Helen’s favorite part of prepping), and, lastly, wrap them in a paper towel and put them in a ziplock bag or food storage container. This little bit of effort saves major time when making salads and smoothies and stretches the life of your greens to 1-2 weeks. Bottoms trimmed and ready for the salad spinner. Excuse me while I do some WORK! Greens spread out on paper towel. Rolled up and into the bag they go! Buy produce that is in season. Organic greens: organic spinach and a bag of POWER deep green blend by Earthbound. Unfortunately Costco doesn’t have organic romaine lettuce packs, so I get those at Whole Foods in a three pack for a decent price. 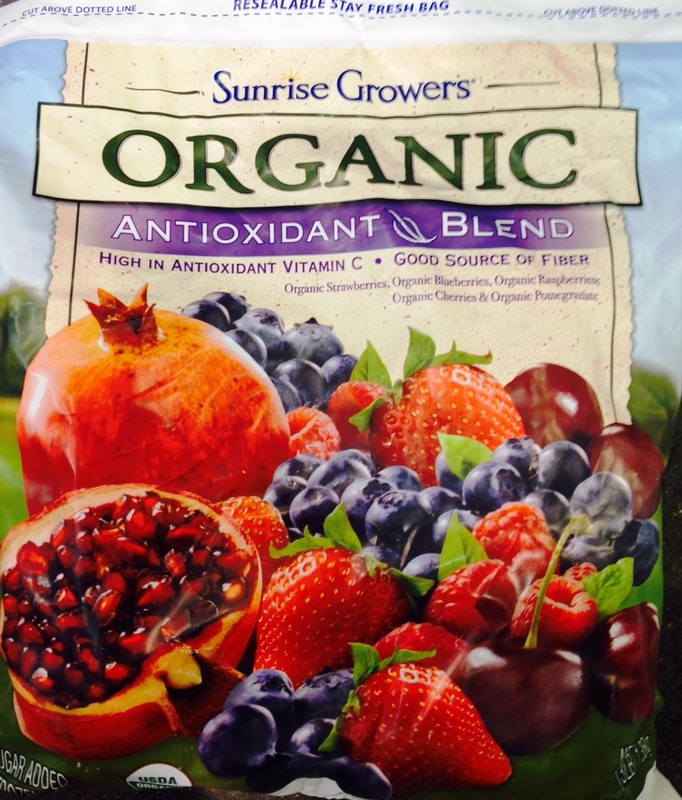 Organic frozen berries: Sunrise Growers organic antioxidant frozen berry blend; these are awesome because they last for a long time and can also be used for more than just smoothies, like topping your steel cut oats in the morning. Don’t throw away produce that is on its way out—> FREEZE IT! When your fresh fruits or vegetables are about to spoil, put them in the freezer to use for smoothies! This works wonderfully with greens (when you see a few slimy leaves it’s time to get freezing-throw away the slimy ones first, then rinse and dry the rest, and put them into a freezer bag), bananas (peel, break into quarters, then into a freezer bag), ginger root (peel with a spoon, then into a freezer bag), cucumbers (peel, cut into chunks, then into a freezer bag), and berries (wash, pat dry, into a freezer bag). Honestly, pretty much everything can go into the freezer, I just mentioned some more popular foods! Store produce so it will last. For food storage tips click here. Sign up to receive an organic local CSA share. This might mean something as simple as a small herb garden or joining a community garden for all you city goers. Follow the EWG’s dirty dozen: this list will help you know what is worth getting organic based on produce with the highest pesticide loads. When I note to buy organic this is the reason why! Going forward, you may see “Coach’s Corner” at the end of my posts. Here I will be asking questions to help you build awareness around your current habits and a plan for the new changes you want to incorporate into your lifestyle. If you are interested, I recommend getting a journal where you can write down your thoughts and clearly define the goals you want to set for yourself. Research shows that the simple act of writing out your goals increases your odds of achieving them significantly. And having someone support you and hold you accountable for your goals increases your success rate even more. Check out options for working with me if you are looking for additional support and guidance with your goals. Is eating greens and other nutrient dense foods on a regular basis important to you? If so, why, what impact does/will this have on your life? What is one small step you might take in the next week to increase greens and nutrient dense foods in your diet? How could you add enjoyment or feelings of achievement to that step? Taking your answers from above, create SMART goal(s). I will go grocery shopping on Sunday and get ingredients for green smoothies. I will make a green smoothie 2x a week when I get home from work and save half of it in the fridge to have on the way to work in the morning. To add some fun, I will put on some music and see if Little Miss wants to help out. I will also note in my journal the days I accomplish my goal and if I’m feeling really ambitious, I will reflect on how that impacted my mood, energy levels, etc. « A Green Smoothie You and Your Kids will Love + Tips for Getting Your Kids Onboard!